In which Christopher gets made, Tony has a breakthrough, and Jackie, Jr., is really bad at staying out of the game. Who's the fortunate son in "Fortunate Son"? It may seem like a rather obvious question to ask, but almost any time an episode of a drama like The Sopranos has a title like this, the show means for it to be ambiguous, possibly referring to any number of people. (Another example: Season two Mad Men episode "The New Girl.") In "Fortunate Son," I count at least four people who are prominent in the storyline that the title could refer to, and I'm sure there are many more lurking around the edges of the episode who might also fit that phrase. For the most part, "Fortunate Son" is an episode designed to get many of the newly kick-started plots for season three up and running, now that the writers have laid Livia to rest. But for the characters, a lot of this is business as usual. So let's run down our son candidates. Christopher Moltisanti: In some ways, Christopher's the most obvious candidate for this honor. The episode is mostly about him, and it opens with him spending a fairly quiet (for football season, at least) day with Adriana in the two's apartment, only to receive a phone call from Paulie asking him to come out and wear some of his finest duds. Adriana just knows it: Today's the day Christopher's going to become a made man. The two have waited for this a long time, and since Christopher has always been like a son to Tony (the ceremony where he's made refers to Tony as his figurative father), they both knew it would eventually happen. 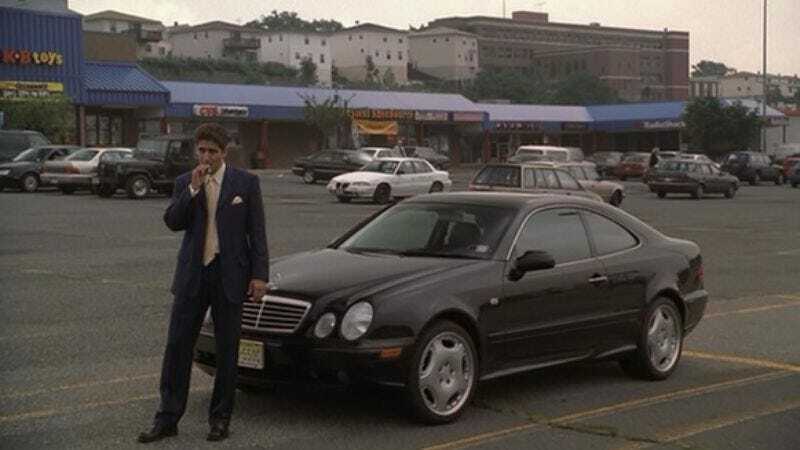 Still, that doesn't clamp down on the happiness both feel as Christopher goes off to meet Paulie in a strip mall parking lot, before being taken to the secretive ceremony and a post-ceremony celebration. Like a lot of the traditional mob elements depicted on The Sopranos, the made man ceremony is not exactly suffused with the kind of grandeur you might expect from the movies. (The movies are, as always, a frequent reference, as first Adriana and then Christopher are upbraided for watching too many of them and, thus, becoming nervous about just where Paulie is taking Christopher.) But the mystery and the sense of importance that might be attached to the ceremony for someone like Christopher, who's only seen this sort of thing in movies, is mostly dispelled for us. It's a pretty low-key affair, more like a Boy Scout initiation than anything menacing. Christopher, in fact, spends much of his time staring at a crow just outside the window, a crow he becomes convinced is an omen of bad luck when having more responsibility proves to have him in over his head. (The crow is just the latest of the season's symbols of death or ill fortune, though this one seems to have little to do with some of the others.) Indeed, being a made guy is nothing like Christopher thought it would be. It mostly involves him screwing up with the sports book Paulie handed to him and being in hoc to Paulie for $4,000. Where Christopher thought he would be headed straight up, he realizes there's even more work to be done. So then why would Christopher be the obvious choice? Because he's always been the heir apparent. With Tony certain that he wants his son out of the game, Christopher becomes the next best choice. He's got something of a head for the business, and even though the pressure seems to get to him, this is a good way to figure out if he can step in once Tony's indisposed. The relationship between Chris and Tony has never been as close as Christopher would like, but it's becoming clear that Tony views Christopher as an incredibly valuable part of his organization, as family beyond just their rather distant familial relation. And if by the end of the episode, he hasn't quite learned how to swim in the new business he's in, he's at least figuring it out as he goes, and much better than he might have been expected to. Christopher, in some ways, is a son-like figure to all of these guys (witness how Paulie tries to get him to stop taking drugs), and they maybe cut him more slack than they would other guys who came up two grand short. On the other hand, they don't try to keep him out of the mob, unlike another candidate for our titular character. Jackie Aprile, Jr.: Jackie, Jr., hung around the edges of the last episode (and I'm just going to call him Jackie, since all of you will know who I'm talking about), but he really begins to come into his own in this episode. He's had everything his father ever wanted for him handed to him on a plate, but he just doesn't have good enough grades to hack it at Rutgers, much less head on to med school. Unlike Tony's newly off to college daughter, Jackie keeps hearing the alluring call of the life his father never wished he would become a part of. He's always hanging around the pizza parlor when Christopher makes his stop, and even a frank talk from Tony can't set him entirely straight. He's going to get involved in this life, whether Tony likes it or not. Which is how Jackie gets mixed up with Christopher (of course he does), robbing a benefit concert performed by Jewel down at Rutgers, Christopher and his associate dressed in Scream masks, and Jackie behind the wheel of the getaway car. He pisses himself while sitting and waiting, but it's also clear that something about this is exciting to him. He's not going to walk away so easily, and now that Christopher's gotten him involved, directly going against his boss' orders, he's come to a point where the decision becomes to be what his father was and hoped he would not be or to continue on the path of the fortunate son, the one who escaped the life of crime and death. That the answer is not immediately clear for him should be answer enough. Anthony, Jr.: The big moment for A.J., of course, is that moment at the end, when he collapses out on the football field after being named defensive captain of his freshman team. It's a neat twist to end the story we've seen a million times before about the kid who comes off the bench and makes the big play and becomes the hero. There's a lot of business in this episode about the things that sons see their fathers do, and it's notable that A.J. spends a lot of the episode sitting off to the edge of the frame, just observing his parents doing what they do or watching his sister up at college with her new friend, Noah. A.J. has yet to really come into his own, but this episode is acutely aware of him as another fortunate son, who has his whole life open to him but seems likely to waste it because of what's been passed on to him by his father. He could be a great leader, maybe (Tony seems to think he should go to Harvard or West Point, of all places), but it seems more likely that he'll fall prey to the malaise so many children of privilege do, unable to become a great man and settling, instead, for just skating by. Tony: The final fortunate son in the episode is Tony, and if I have a complaint with "Fortunate Son," it's that the psychological answers of the episode are too pat. Sure, the idea that Tony has some sort of long-standing aversion to meat because of seeing his father cut off old Satriale's pinky finger when he was a little kid makes sense, more or less, but it feels like too convenient of an answer in the moment. Melfi treats it as a huge breakthrough, of sorts, but I just don't buy it. It's not that the answer isn't cleverly foreshadowed or anything like that. It's that the breakthrough tries too much to stand in for all of Tony's issues, many of which stem from the unexamined center of his life. The revelation feels significant and is treated as significant, but it's not, not really. It's not the key to unlocking whatever lies at the heart of Tony Soprano, whatever's causing him to have these panic attacks. And I think the show is suggesting that by showing that these attacks have been passed on to AJ. But there's too much import given to something that feels, in essence, like a bit of dream analysis. On the other hand, most of the rest of Tony's journey in this episode works very well. Seeing his memories of his youth is always enjoyable, and following him to one of A.J. 's football games makes for a surprisingly funny scene. This isn't a Tony-heavy episode, in that he's involved in most of the plots but driving very few of them, but it is an episode about how everyone around him is trying to curry his favor, even as he's trying to better understand just what it is that makes himself tick. If there's a real fortunate son, it's Tony, who, yeah, has the weight of the world on his shoulders and, yeah, can't get his daughter to speak to him because he's a racist, but finds himself in the middle of vast wealth and power, the likes of which his parents never would have dreamed of. His mother, the greatest stain on his life, is dead, and his family seems to be coming along all right for the moment. There are rumblings on the horizon (there always are), but Tony Soprano seems to be flush, fat, and happy. "Fortunate Son" isn't the strongest episode of season three (that's, arguably, coming next week), but it is a vastly important episode in terms of the show putting its pieces in place for the season to continue. It's also instructive in how it illuminates the show's collection of short stories approach. Season three is perhaps the season with the loosest overall structure, and the first few episodes all essentially function as short pieces within a larger whole, telling the story of FBI agents performing surveillance, a son coping with his mother's death, and a collection of men who all find themselves taking steps to further their own lives and careers in one way or another. The third season of The Sopranos offers up a series of sketches of these people at a time when things are going pretty well, and it asks us to fill in the colors on our own. "Fortunate Son" is less important for how it kicks the plot off and more important for how it brings us into the heads of Christopher, Jackie, A.J., and Tony as the season begins in earnest. The story will begin soon enough, the show seems to say. But for now, let's enjoy figuring out what makes these people tick. Christopher's looking for stuff to sell to pay back Paulie. Naturally, he thinks of Adriana's tennis bracelet first. Ain't love grand? I've been trying to think of other episodes with ambiguous titles that could stand in for just about any character. See how many you can come up with in comments! Meadow's adventures at college continue to feel like an entirely different series about spoiled rich kids. Fortunately, the show grasps that Meadow, too, is one of those spoiled rich kids and doesn't give her a pass. A.J. 's mystification that anyone would want to talk to him about anything (like when he's asked about whether there are any hot cheerleaders) always amuses. Here's the kid who's supposed to carry on Tony Soprano's legacy (obliquely, Tony hopes), and he's not even up to some small talk. I like the scene with Tony and Artie talking about the differences between when they were kids and how their kids are today. A nice acknowledgement of some of the episode's deeper themes, without being too obvious about it. This is our first time meeting Carmine and Benny Fazio, both of whom will become inestimably important to the series later. On this latest go-round through the show, I'm always amazed at how some characters just gradually become more and more important. Take, for instance, Bobby. You'd never guess that a few of the most gut-wrenching moments of the final season would involve him. He's mostly just bumbling comic relief at this point. Another thing I'm noticing (and this is one of the great pleasures of a TV rewatch when you know how everything will turn out) is just how well so much of this plays as tragedy now, particularly the Christopher and Adriana scenes. We know what's going to happen now, so it becomes that much more fascinating to see these two just going about their daily lives, not knowing that those lives will be blown to pieces in a few short years. And, of course, Tony's breakthrough about the meat isn't the be-all, end-all it's presented as here. There's much more going on in his head, and the struggle between him and Melfi to get it all out in the open will dominate much of the rest of the series. But we'll get to that. The Sopranos: "Employee of the Month"
Seinfeld: "The Wallet"/"The Watch"/"The Bubble Boy"
The Sopranos: "Mr. Ruggerio&apos;s Neighborhood"